You should NEVER aim a laser pointer at or near an airplane or helicopter. It is not safe, you may be arrested, and you may help get laser pointers banned. Below is more information about these three aspects. Even a very weak beam can be a distraction. 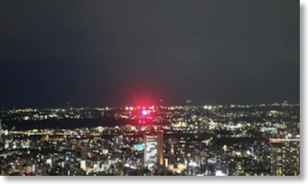 The photo below shows a 1 milliwatt beam seen at a distance of 20 kilometers (12 miles) across Tokyo. 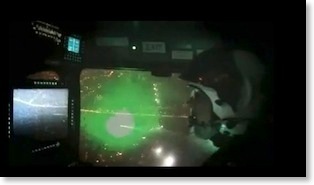 This still frame shows the brightest “hit” from a video of a police helicopter incident. Glare -- the pilot cannot see past the light as long as the laser is on the cockpit windscreen. Flashblindness and afterimage -- the pilot cannot see until the afterimage has faded. More photos from this FAA test are here and here. To make things even worse, a pilot being targeted may also be worried about eye damage and eye injuries, and the possibility of the laser being an aiming device on a weapon. A worried pilot is a distracted pilot -- not a good thing during critical flight phases such as landings, takeoffs and emergency maneuvers. 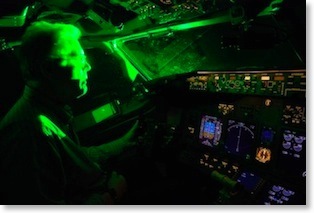 If you still do not believe that laser light is a hazard to pilots, please see the FAQ for doubters page. This is expensive and a major hassle. You do NOT want to hire a lawyer to represent you in a trial with a state or federal prosecutor. In the United States, there is a federal law that makes it illegal to aim a laser pointer at an aircraft, or the flight path of an aircraft. There are also numerous state laws, many of which are listed on this page. Outside the U.S., there are also other countries with laws against laser pointers. Some of them are listed here. In October 2008, a California man was sentenced to two years in prison for aiming a 3 milliwatt laser pointer at an aircraft. Note that he was using a relatively low-powered laser, about the same strength as a supermarket checkout-stand laser scanner. In January 2009, a Cleveland Ohio man was sentenced to three years in prison for hitting two airplanes and two helicopters. In January 2011, a Massachusetts man received a 3-year prison sentence for aiming at a helicopter. The aviation-incident news page on this website has many more stories about incidents and arrests, plus we have a special page with a long list of fines and jail sentences for laser misusers. Because laser gunsights are common, police get very worried when someone points a laser at them. In Florida in 2005, a man was killed when he refused to stop pointing lasers at officers. A similar situation happened in Thailand in 2010. You don’t want to cause any misunderstanding where officers in a targeted police helicopter “shoot first and ask questions later”. There have even been cases where ordinary citizens get upset with laser pointer harassment and kill people, such as in Greece in 2011 and in Russia in 2013. In 2015, laser-aircraft incidents happened more than twenty times each night in the U.S. You can understand that pilots and the FAA are upset about this. If laser pointers were banned in the U.S., this would be fine with them. Some U.S. cities, such as Ocean City MD, Ocean City NJ, and Myrtle Beach SC have severely restricted or banned laser pointer sales and possession. New Jersey’s legislature passed a bill to ban laser pointer sales above 1 mW; the bill was vetoed by the Governor. 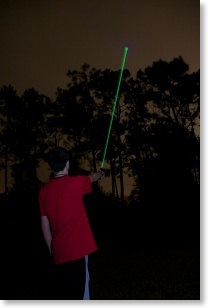 New Zealand in 2013 restricted laser pointer sales above 1 mW. Countries such as Canada and the U.K. also are considering bans on laser pointer sales. So if you like using laser pointers, don’t add to the long lists of aviation and non-aviation laser incidents. 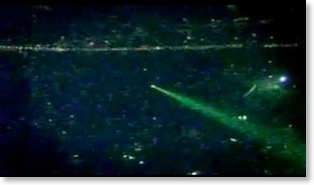 New South Wales officials got fed up after lasers hit airplanes landing at Sydney’s airport, in March 2008. The Australian state banned laser pointers and put them in the same “dangerous weapon” category as guns and crossbows. Possession and/or misuse of laser pointers can get you a fine or even up to 14 years in prison. NEVER aim a laser beam at an aircraft, a vehicle, or towards strangers. In other words, DON’T ANNOY PEOPLE WITH THE LASER BEAM.